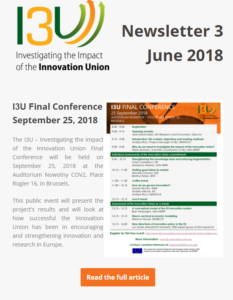 I3U – Investigating the Impact of the Innovation Union has just released their fourth newsletter. It opens with the reflections of Pierre Mohnen, the project’s scientific coordinator, on the state of the Innovation Union and the challenges it still faces. It then discusses the results of the final conference on September 25 as well as the September 10 conference. It also looks at the socio-economic impact of the Innovation Union’s commitments and the presentation of the project’s findings at the September 10 conference and the TAKE conference. Finally, it details some of the partners’ dissemination efforts, including the new book to be released, published papers, and articles in scientific journals. 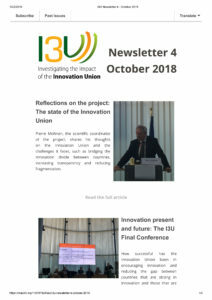 I3U – Investigating the Impact of the Innovation Union has just released their third newsletter. The newsletter announces the final conference and discusses the newest results of the project. It also details recent and upcoming presentations of the project throughout Europe, along with details on where its findings have been published. 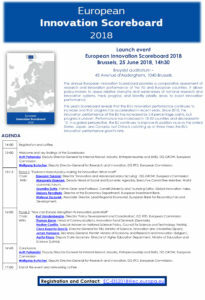 The 2018 European Innovation Scoreboard will hold its launch event on June 25, 2018 at 14h30 at Breydel Auditorium – 45 Avenue d’Auderghem, 1040 Brussels. The EIS, discussed in this I3U report, provides a comparative assessment of research and innovation performance of the EU and European countries. It allows policy-makers to assess relative strengths and weaknesses of national research and innovation systems, track progress, and identify priority areas to boost innovation performance. This year’s Scoreboard reveals that the EU’s innovation performance continues to increase and that progress has accelerated in recent years. Since 2010, the innovation performance of the EU has increased by 5.8 percentage points, but progress is uneven. Performance has increased in 18 EU countries and decreased in 10. In a global perspective, the EU continues to improve its position vis-à-vis the United States, Japan, and Canada, but China is catching up at three times the EU’s innovation performance growth rate. A conference on the Innovation Union in Europe: Accomplishments and challenges will be held in Warsaw on September 10, 2018. Innovation is regarded as a core element of the Europe 2020 strategy as it can help Europe face different economic and societal challenges, such as the demographic changes, health and ageing of European society, global competition, climate change, and resource scarcity. The Innovation Union is one of the flagship initiatives of the Europe 2020 strategy. The main objective of the Innovation Union is to strengthen Europe’s innovative potential. It has been translated into 34 specific innovation policy commitments aimed at boosting innovation in Europe through the development of education and skills, financial incentives, knowledge transfer, cooperation in science, and other efforts. Eight years after the implementation of the Innovation Union initiative in Europe, where is Europe with regard to innovation performance and what is its impact in terms of competitiveness, growth and employment? The main objective of this conference is to evaluate direct and indirect effects of the EU policy instruments that promote the Innovation Union in Europe and, specifically, a stronger European dimension of the R&D base. 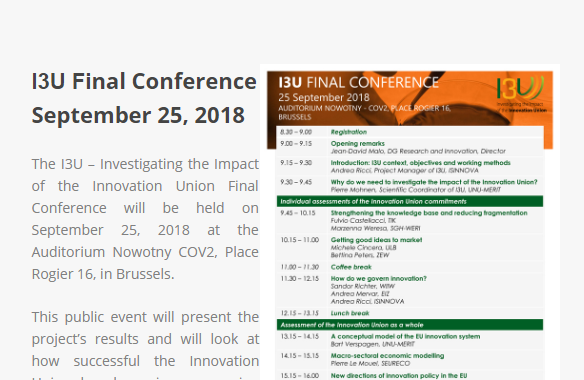 The conference will present the research results of I3U – Investigating the Impact of the Innovation Union. The deadline for abstract submissions is June 30, 2018 and notifications regarding acceptance will be sent to the authors by July 10, 2018. Participants presenting a paper during the conference are asked to submit their full papers by July 31, 2018. 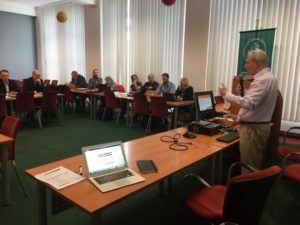 An I3U Project and Scientific Advisory Committee (SAC) meeting has been held in Warsaw, Poland on 26-27 April 2018. The partners, along with members of the SAC, discussed the main findings of the project and the next planned actions. 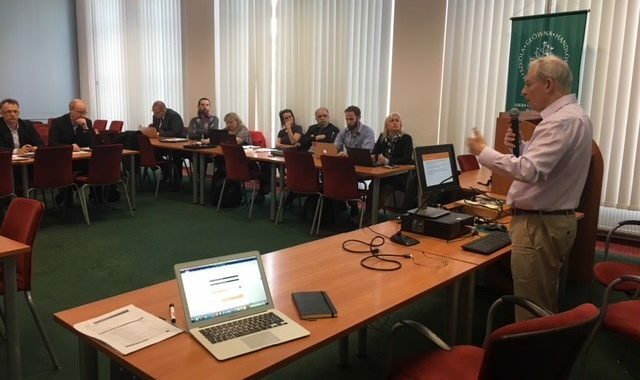 The discussion focused on the expected contents of the next batch of deliverables “Integration in the Eco-system” due by the end of May 2018.